Grandma planned to take each grandchild on a trip when they graduated from high school. Madisen wanted to swim with sharks. 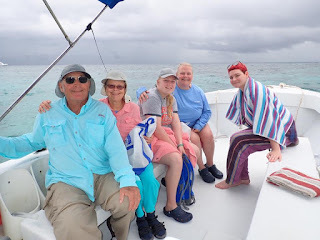 We did see a lazy nurse shark but we had a whole lot more experiences with grandpa and with Madi's mother. Grandpa Don fished for three of the days. Here we are looking at crocodiles in brackish water. In the background there are black mangroves. During slower moments, I shared my painter's eye by inquiring of Madi and Madisen how many colors they saw in the leaves of the red mangroves. We all see differently so there was no right answer only what you perceive. 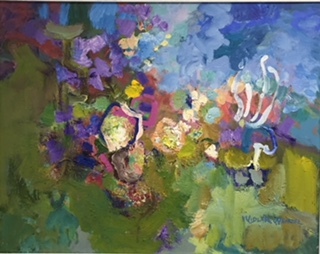 After our family Christmas trip to Belize, I brought home this abstract painting from a four month exhibit at Albany Public Library. To my surprise I realized I had painted the lighting like what I saw with my uncorrected myopic eyes while snorkeling. The first day I did not bother to put contact lenses in my eye. The second time I had a contact corrected for far vision. The third time only a contact corrected for close vision and the fourth time I bent the frames of an old flexible sports glasses frame so it would fit inside my 180 degree snorkel mask. What I saw was amazingly similar to the more organic abstracts I paint. Just goes to show me what I see as a painter is already what I look for when I paint. To the left is one of our guides, Abel Coe's photos with his new Olympus underwater cameras. He could find the candy colors and exquisite patterns in a variety of reef habitats. He gave all of us permission to use his photographs. This was my granddaughter's first experience snorkeling and my daughter had not snorkeled since she was 10 or 11 when we were in Hawaii. I went snorkeling 4 times and my daughter and granddaughter went out 8 or 9 times. I was happy to see them enjoy so many new experiences at the atoll They also enjoyed special excursions on the mainland including the Mayan Altun Ha ruins, the tube float through the caves, and the Belize Zoo. Don after his three days of fishing joined us once on the snorkeling adventure boat. Also with us is to the far right Tash now from Saskatchewan, Canada. Like Madisen who is considering secondary education and a sophomore at Concordia University in Oregon, Tash is a university student. Tash is currently interested in many things including anthropology psychology. Next Wednesday I will post some pictures about the ecology of Turneffe Atoll. Lovely area to go during the cold winter. I got the worst case of chiggers at the Belize Zoo, but did enjoy the beaches and beach food and the ruins.